1. 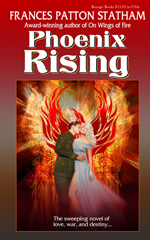 Phoenix Rising encompasses a World War I love story between Kenna Chalmers, a debutante who becomes a nurse in an army base hospital in France and Capt. John “Irish” Fitzpatrick, a member of the 82nd Division, who fights in some of the bloodiest battles of the war.